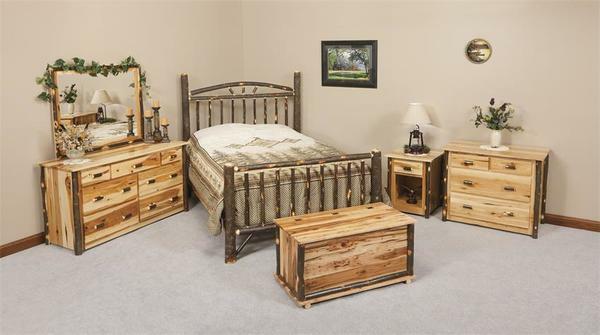 Furnish your bedroom with this impressive and exquisite Amish Hickory Wood Bedroom Set. It is truly the ideal Bedroom Set for your cabin, lodge, or vacation home by the lake. It is composed entirely of Amish Hickory Bedroom furniture that is made to order and handcrafted by Amish craftsmen that have been making furniture for over 25 years! This Amish Hickory Bedroom Furniture Set consists of two Dressers, one Bed, one Night Stand and one Hope Chest. If these Hickory Bedroom Furniture pieces were sold and shipped individually, it would total well over $5,000. Save money furnishing your Bedroom by purchasing this complete set which includes free shipping. Amish Rustic Cabin Hickory Wagon Wheel Bed - If you've been looking for that Rustic and Country style bed for your Bedroom, you've come to the right place. Sleep in comfort on this refined and lovely Hickory Wagon Wheel Bed from the Amish Rustic Cabin Hickory Collection. Handcrafted and made to order by Amish Craftsmen that have been making furniture for over 25 years, you can rest assured knowing that this Hickory Wood Bed is built with heirloom quality hand craftsmanship right here in the United States and will last for generations. Amish Rustic Cabin Hickory Seven Drawer Dresser with Optional Mirror - This Amish Hickory Dresser will make a grand addition to your Bedroom. Store and organize all your clothes in this Dresser that is made to order and handcrafted by our talented Amish woodworkers. With an additional mirror included with this Seven Drawer Dresser, you won't leave the house without looking your absolute best. Amish Rustic Cabin Hickory Four Drawer Dresser - This splendid and impressive Amish Hickory Dresser has Four Dovetailed Drawers to store and organize all of your clothes. This Amish Hickory Dresser is handcrafted and made to order by Amish Craftsmen that have been making Amish Furniture for over 25 years. Amish Rustic Cabin Hickory Night Stand - This Amish Hickory Night Stand is the perfect accent to your bedroom set. Ideal for storing your night time essentials close by such as your phone, glasses, books, and TV remote. This Night Stand is built to order and handcrafted for your home alone with quality American craftsmanship that will last a lifetime. Amish Rustic Cabin Hickory Hope Chest - This Hickory Hope Chest is both alluring and refined. Traditionally for young women to keep their wedding dress in, hope chests have a great sense of history and make an ideal addition for any Bedroom. This Amish Hickory Hope Chest is handcrafted with pride by our Amish woodworkers.